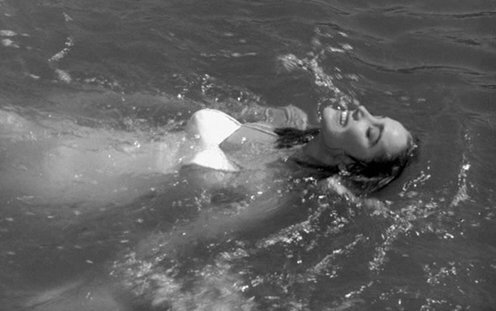 There always seem to be rumors of an impending Creature from the Black Lagoon remake. John Landis had one in development in 1982, John Carpenter in 1992, Ivan Reitman in 1996, and Guillermo del Toro in 2002. The John Landis production sounded particularly appealing, largely because Landis brought in the great Nigel Kneale to write the screenplay. I first became obsessed with Nigel Kneale through the 1989 TV-movie The Woman in Black. Tremendously impressed with the movie, I rushed to read the Susan Hill novel only to find it a bit of a disappointment (note: I am aware this is a minority opinion). But it wasn’t entirely a loss because the experience tremendously increased my appreciation for the art of screen adaptation—how Nigel Kneale unerringly selected the very best parts of the book and developed them brilliantly. If I were ever to teach a course on screenwriting, I’d center the course on this novel and Kneale’s adaptation. 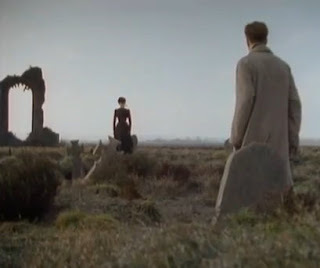 The Woman in Black (1979). Much of Nigel Kneale’s screenwriting work was done for British television and is currently fairly inaccessible. 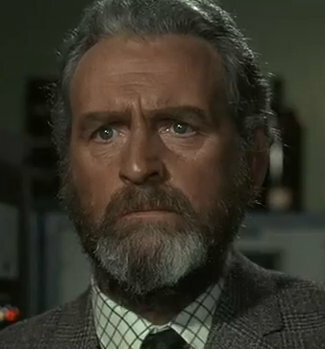 The three Quatermass movies are full of good material, but the legendary TV mini-series that they were based upon are either lost or elusive. I love Kneale’s wrap-around story for the Ray Harryhausen First Men in the Moon (1964), which opens and closes with the first lunar landing. For a low-budget genre exercise, Kneale’s The Abominable Snowman (1957) is startlingly intelligent. 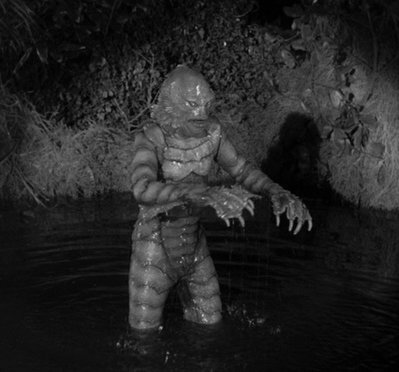 I’m confident that a Nigel Kneale-penned Creature from the Black Lagoon would have been smart… very smart. Someday maybe I’ll learn how smart. He did write and submit his screenplay, so it must be on file somewhere. In the meantime, I can always conjecture. Quatermass and the Pit (1967). 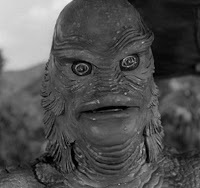 I don’t mean to be overly critical of my beloved Creature from the Black Lagoon. For the most part, I find its cockeyed science completely charming. Like many 1950s science fiction thrillers, it somehow manages to be respectfully in awe of science while remaining completely ignorant of the most basic scientific principles. 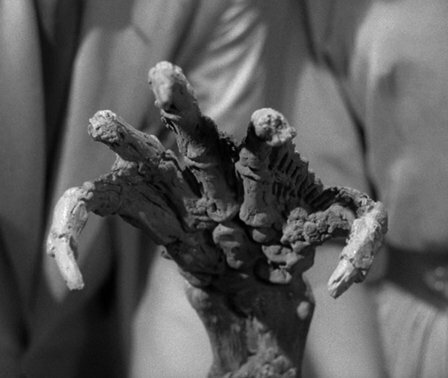 The Creature makes a hash of geology, paleontology, and biology, but it means well. 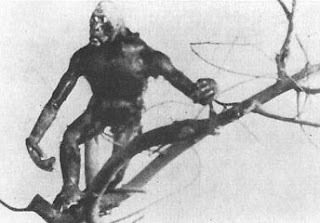 In the movie’s evolutionary theory, the Gill Man is presented as a missing link between fish and man. The scientists intimate that he evolved in the Devonian period (400 million years before the appearance of Homo sapiens). It appears that the Black Lagoon’s Creature is the last of its kind. An alternative explanation is suggested two sequels down the road in The Creature Walks Among Us. In that movie, a medical reconstruction of the Gill Man reveals human skin and lungs, implying that the Creature evolved from humans. Like whales evolving from an early hoofed mammal, the Creature’s human-like ancestors returned to the waters and re-adapted. Note: Let’s be honest: In reality, the Gill Man is the swamp child of the dinosaurian Rhedosaurus in The Beast from 20,000 Fathoms (a big Hollywood hit of 1953) and the Frankenstein-ian alien of The Thing from Another World (a big Hollywood hit of 1951). Mix and match their DNA, stir thoroughly and simmer on low, and you might spontaneously generate something vaguely Creature-ish in size and shape. Scientists are well represented on the expedition to the Black Lagoon, with either four or five scientists aboard the Rita. Dr. Carl Maia (Antonio Moreno) is introduced popping a fossilized Creature hand from the rock beds. He appears to be a paleontologist and serves as one of the movie’s two benevolent father figures. Dueling alpha male scientists Dr. David Reed (Richard Denning) and Dr. Mark Williams (Richard Carlson) vie for top dog status throughout the movie, bickering about scientific strategies on the surface while subliminally competing for the lone woman on board. 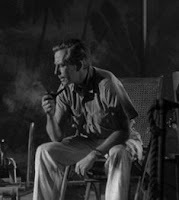 And last there’s gentle pipe-smoking Dr. Edwin Thompson, the film’s second father figure, played by 1950s stalwart Whit Bissell. Does the beautiful Kay Lawrence count as a fifth doctor on the Rita? She appears to have some scientific training and Dr. Thompson implies that much of Dr. Reed’s success is owed to her. But you never hear anyone refer to Kay as Dr. Lawrence. She’s allowed an active part in their impromptu scientific conferences, and she contributes ideas that are no stupider than the statements of the identified scientists. But even if she really is Dr. Kay Lawrence, sharing a Ph.D. in Hollywood Science with her peers, I still have a sneaking suspicion that she’s the lowest-paid American on the boat. 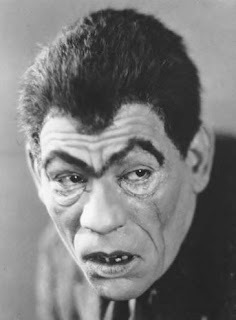 Traditionally, Hollywood’s missing links tended to be extra-hairy humans rather than quasi-amphibians. Missing Link (1915) by Willis O'Brien. 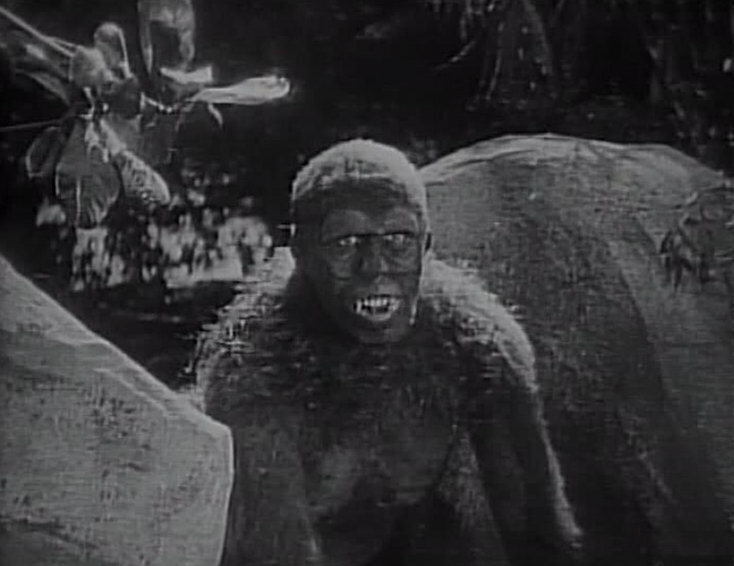 The missing link from The Lost World (1925). 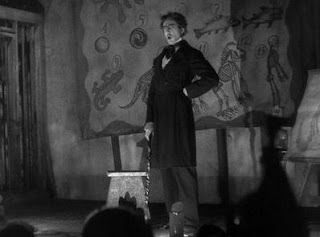 Murders in the Rue Morgue (1932). When processing Creature information, it all boils down to this: If Tom Weaver says it, I believe it. 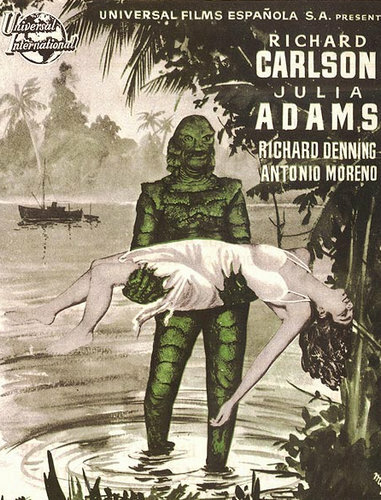 Purchase a Creature from the Black Lagoon DVD or Blu-Ray set at Amazon or Barnes & Noble. 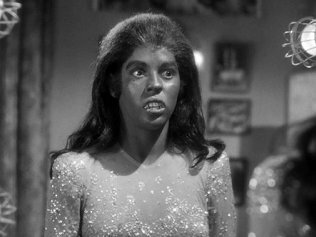 Rent Creature from the Black Lagoon at Netflix or other rental service.